In 2017, Justine and The Unclean made an impact on the power pop and pop-punk scenes with their debut release ‘Get Unclean’. The album didn’t especially break new ground, but between its instant hooks and Justine Covault’s sassy vocals, it didn’t take long for the songs to stick. The album also showed a strong musical talent in mixing bits of punk, power pop, classic rock and even the occasional metal riff together, creating something very potent. 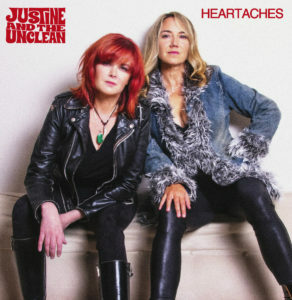 Utilising the “mini album” format – a very 80s trait, but it was good enough for Billy Bragg and it certainly works for Justine – ‘Heartaches & Hot Problems’ values quality over quantity at just six songs and, as you’d hope, there are at least a couple of killer hooks to be found within the all too spritely seventeen minutes. Issued as a free download ahead of ‘…Hot Problems’, the brilliant ‘Be Your Own Reason’ taps into the band’s slightly punkier edge once more. Couvault’s vocal is instantly recognisable and when placed against a high octane riff and an occasional old school lead guitar, it gives the band a stand out track, regardless of settling for a one line chorus. It’s the pure energy that makes the track work, though, and its jangly guitar tone is especially cool with its defiantly Bostonian edge, offering much closer to the Lemonheads’ ‘Lick’ than the more typical Ramones recycling. A second free download, ‘The System Is Set To Self Destruct’, is a touch slower, but by presenting a chunkier riff against a heavier drum sound, it has just as great an impact. Here, Covault and co tap into something that could’ve easily been culled from an old Letters To Cleo album, such is its sugar coated power pop charm. As with a couple of tracks from the debut, this number really escalates once Charles Hansen steps forth with the kind of rock ‘n’ roll guitar solo you might find on an album by label mates Watts or Hansen’s own involvement with Tom Baker & The Snakes. If you were a fan before, you’ll love this. The standout track, ‘Heartache Knows Your Name’ provides an incessant earworm thanks to another simple lyric and a hugely buoyant riff. Showcasing the band’s strongest style in a shade under two and a half minutes, there’s no time for any padding or flashiness here – it really is all about the pop-punk charm. With Justine curling her vocal affectations around a very rhythmic backdrop once more, the closest reference point – aside from sounding like the most logical continuation to the Unclean’s debut – would be The Go-Go’s excellent comeback record from 2001. With this number, especially, the band stick to a tried and tested formula, but that highlights the quirks in Covault’s delivery and the energy within the whole band. Changing the mood, ‘Monosyllabic Man’ features an intro that’s very much inspired by the early Cheap Trick, before things drop into a different kind of 70s rock, blending the power pop with something a little crunchier. The slower approach means that this track doesn’t make such an instant impression – and is one of those times when a more complex chorus definitely would’ve been welcome – but musically, it’s still very strong. More so than before, Janet Egan’s bass adopts a fierce grumble, but if anything makes this number truly work it’s the featured guitar solo. Having hinted at a dirty, bar-room style on other tracks, Hansen finally cuts loose with something that carries the heart of Johnny Thunders and the trashiness of New York Dolls. A tale of a broken relationship set against a heavy stomp, ‘Margaritas & Second Hand Smoke’ is one of those musical tales you just know will never end well. Luckily, the sneering lyric comes with a great musical arrangement. Hansen revisits the bar-room grit of the Snakes – peaking with a fiery lead guitar solo, presenting his best playing this time out – while the rest of the band provide some contrast with a tight melody and a few welcome harmonies. It’s almost a throwback to a couple of the moodier tracks from the debut, only this time there’s a much bigger confidence driving everything forward. When faced with a disc that includes ‘Be Your Own Reason’ and ‘Heartache Knows Your Name’, it seems unlikely that this number would ever become a favourite, but all records need a sense of contrast… Finally, ‘Love Doesn’t Know A Thing’ has a very 90s feel – with nods to the post-grunge sound combined with a melodic harmony, it feels like the ultimate throwback. As before, the clean style of Justine’s voice rises above everything in a way that makes you just want to listen, while Charles peppers the slower groove with all manner of fills, before peaking with a very retro solo. It’s one of those tracks where the tune feels more important than the hook, but the more reflective style makes it a great closer. ‘Get Unclean’ was always going to be a hard act to follow, but at least three of the songs on ‘Heartaches’ represent Justine And The Unclean at their very best. If you’re already familiar with the band, you’ll definitely want to hear this. It might be three songs too short and occasionally recycle a few of the debut’s best ideas, but it’s a very welcome return indeed. Read a review of ‘Get Unclean’ here. This entry was posted in Album & EP Reviews and tagged justine and the unclean, pop punk, power pop, rock, rum bar records by Real Gone. Bookmark the permalink.